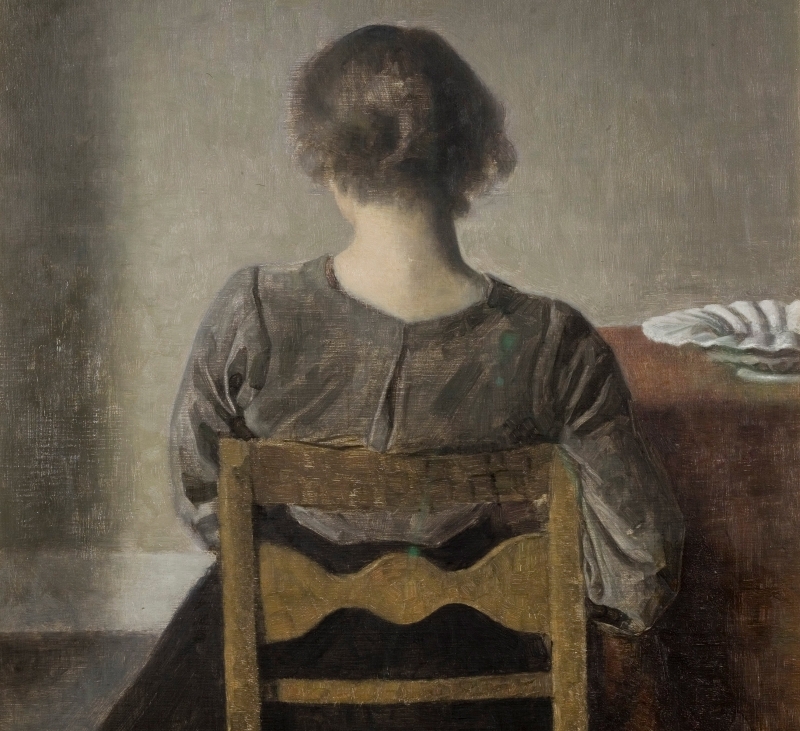 “Repose,” oil on canvas, by Vilhelm Hammershøi, 1905. Did you pay the gas bill, he says: a sentence, not a question. The lampshade is dusty. And, where’d you put the car keys? He is always surprising her with his dissatisfaction. One time, he comes home from work to find her drinking a glass of wine and his mouth turns down. “What?” she says. From the corner of her eye, she sees her own hand loosely touching the stem of the glass, her bare thighs in the pajama shorts she wears to bed: all her guilty body. “Mind if I have a glass?” he says, looking from her to the wine bottle, from the wine bottle to her. “Of course not,” she says. It’s her first glass, her first few sips. The baby lies in her arm, sleeping. It’s like he’s asking some other question. The cupboard door rasps, the glass clinks and because she’s not looking, his irritation bounces off her, it glances off her and falls harmlessly elsewhere, like a wasted super-power. “Baby,” she’s saying. “Baby, baby.” She risks waking the child for no real reason. She clucks and bounces her until the girl raises her tiny fists in defense. The cork pops and when she looks up, he is pouring, his movements exaggerated and precise—it’s cupboard, glass, uncork, pouring—as if this were some kind of demonstration. “So I could have some, too. Is that too much to ask?” And he has that cordial smile. “Well, here I am,” he says and spreads his arms. There he is. He is squinting his eyes like she’s someone he might recognize. She would be devastated if something happened to him—a car accident, for example, it’s entirely possible. The road winds through the trees, and he works hard, to the point of exhaustion. There’s sliding and darkness. Deer. Even, sometimes, ice. The thought comes to her from nowhere, when she’s washing up after her dinner, it drops on her like a high, heavy weight. She has to stop and put the plate back in the sink before she drops it. She’s oppressed by the strangeness of his absence, though he’s sitting right there, at the table, still eating. Without turning, she sees him reflected in the window. The kitchen is smelling like carrot baby food and stew, familiar and comforting—a little soiled, like diapers. There are beads of moisture and her reflection in the window. Stuffy. He’s always turning up the heat. They would send a sheriff to tell her. After that, she can’t imagine, who could imagine? She would be on her own without even having chosen that. It would be a tragedy, a process, an adjustment. It would be something that just happened, to her. The heat pump still needs to be serviced. At any moment, that’s what he’ll be saying. Eric. She turns her head to look at him—her husband—over the kitchen table. He is eating broccoli, cutting it with his knife. He is lifting the little trees up to his face with the fork. Betsy Porter lives and writes near Portland, Oregon. Her stories have been published in The Timberline Review and performed by Liar’s League. Wonderfully written. I felt immediately drawn into the characters and their world. And now I want more! This story is like a perfect, lethal ice stalactite. I think Ron. Lavalette summed it up perfectly. I like this, especially: his irritation bounces off her, it glances off her and falls harmlessly elsewhere, like a wasted super-power.